Pandion more than met our expectations for a peaceful waterfront vacation spot. The views of the water and surrounding areas were lovely, the home was very comfortable, clean and attractively decorated and the location was very convenient. We enjoyed bicycling, kayaking, reading, the hot tub, cocktails on the dock, meals on the screened in porch, while looking out at the water, seafood at local restaurants and touring the nearby towns. We certainly hope to return to Pandion. Pandion was close to St Michaels and had extra amenities that made our stay more enjoyable. We like kayaking and crabbing (catch and release!) from the pier. Also the hot tub was a hit with the grandkids. House nicely decorated with everything we needed for a quiet, relaxing vacation. My son loved the billiards table! 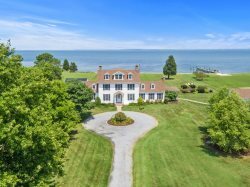 Perfect location - convenient to St. Michael's, Tilghman Island. Extremely quiet/peaceful with great water views. New dock is great for sitting/fishing. Top notch amenities including hot tub, pool table and kayak. Everything was perfect. Beautiful, quiet settings. I hated to leave, the house was perfect. It is the first vacation place that I would have loved to live year round I hope to be able to come back again. Pandion has it all! woods, water, privacy. One of the best vacations we have taken. The location is beautiful, lots of crabs to be caught, just bring your crab trap and a big pot! then enjoy your catch in the screen porch followed by a soak in the hot tub, and if you can force yourself to leave the property, St Michael's is an adorable town with nice people, shops and lots of places to eat. It doesn't get any better. We spent a wonderful and relaxing weekend at Pandion. It was just what we needed; secluded, spacious and serene. The house is immaculate, the new pier is beautiful, and the spacious living room with comfy couch makes your stresses melt away. Great little towns with shops and wonderful restaurants. The flat landscape is great for biking, running and more. The weekend farmers' market is a taste bud delight. The charming "Out of the Fire" restaurant is delich! We would have stayed forever! Property is secluded; yet town is close enough to enjoy amazing restaurants, shopping & local attractions. Pandion = perfect respite; turn key ready; kayak, b-b-q grill, hot tub, waterfront beauty surrounds you. Super clean, comfortable furnishings / the bed was amazing; I slept like a baby; not the norm in a "strange bed". Pandion = easy elegance; we'd return in a heartbeat! We had a wonderful stay at our cabin, and we couldn't have asked for much more. Idyllic and peaceful across the board. We all enjoyed our stay at Pandion, It was very private, yet convenient to St. Michaels.The new dock is beautiful, all it needs is a ladder. We are looking forward to returning this summer. Wish we had come in May and stayed a little longer. Pandion is a wonderful, off the beaten path property- directly on the water. The woods surrounding it make it serene and private. We were visiting Easter weekend, so the weather was still chilly. For this reason, we needed to use the gas fp a fair amount. Unfortunately, the gas ran out the night prior to our leaving. So caution! Despite the cool weather, we biked to town ( @ 4 miles) which is lovely, but small. Kayaked on the creek ( a 2 person kayak is included) and enjoyed the hot tub. If you are taking dogs, caution--next door neighbor was firing off shotgun ( couldn't determine if hunting on his property or target practice)--but it was unsettling. Summer and fall are likely the most ideal times for this location. First and foremost, ESVR made the whole process completely effortless. The services they provided for me were great, from the very first call to the selection and execution of the lease they were extremely helpful. ESVR is first class. The home we rented, "Pandion" was very clean. It was as though the improvements were brand new. Fresh paint through out and everything worked perfectly. The views were awesome and yet private. I just hated to leave. I can't wait for my next trip to this area. Very relaxing home and location. Would love to return for a week. Our family stay was very relaxing and our two fury babies loved it as well ! The Home was just what we needed and perfect for our stay ! The town was just adorable and all of the neighbors that we met were so wonderful and helpful. Thank you for sharing your home with our family ! Very peaceful and comfortable. Two suggestions: A sofa for the screened in TV room and some paring knives. this is a great cottage for 1-2 couples and kids, looking for water fun and relaxing. the house is clean and quite functional with all the items needed for a long weekend. the beach and dock were great and even little kids could enter/exit the water with no issues. stock up on supplies and enjoy a weekend on the water. We spent 2010 Labor Day weekend at the Oxford Beach Cottage. It was the first time we rented from Eastern Shore Vacation Rentals and we had a great experience. The rental office personnel were very pleasant. The house was basic, but had everything we needed. Great for children, with a nice grassy backyard, small beach and dock. My husband sailed from Deale, MD and we met there. It was great sitting at the dock and watching the sail boats go by. The house was nicely decorated. It could benefit from new carpet, a CD player and a bigger dining room table, but other than that it was perfect for us. Thanks for a memorable weekend! Beautiful spot...Looking forward to my next visit. Great location with own beach, price point was very reasonable and interior space was warm and relaxing with plenty of space for a family or couple's.